Bryzzzzz: Was Ilya Bryzgalov benched for falling asleep in Flyers team meeting? Former Philadelphia Flyers goalie Ray Emery shut out the Minnesota Wild on Tuesday night with a 20-save performance. Former Philadelphia Flyers goalie Sergei Bobrovsky shut out the San Jose Sharks last night too, with a 30-save performance. 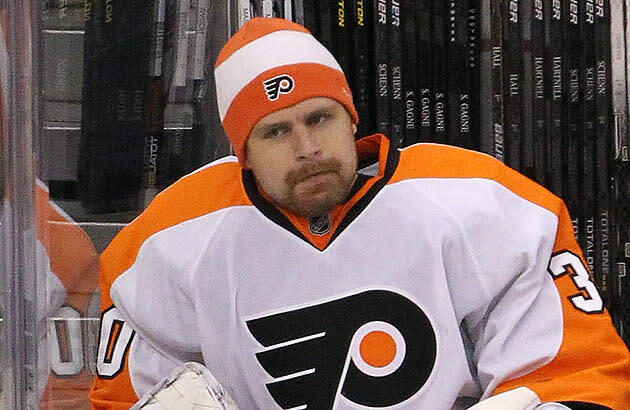 Meanwhile, current Philadelphia Flyers goalie Ilya Bryzgalov sat on the bench to watch his team lose to the Islanders, and then needed defenseman Kimmo Timonen to clear his name on local radio after a report that Bryzgalov was benched for falling asleep in a team meeting. Steve Mason got the start against the New York Islanders, which was a critical game vs. a team the Flyers were chasing. To repeat: Steve Mason, just acquired at the trade deadline, started a critical game over a goalie in the second year of a 9-year, $51-million contract. Peculiar? Certainly. Then came a report from 97.5 The Fanatic in Philadelphia that Bryzgalov had been benched for falling asleep in a team meeting. Once more, with feeling: Former Flyers goalies helping their teams win with shutouts. Current Flyers goalie needing his name cleared by a teammate, lest everything think he’s narcoleptic.